Paid political advertisement. All writings and opinions on this site are those of Lisa Feroli unless otherwise credited to another author. This disclaimer was added to avoid some from filing complaints with the Florida Elections Commission as has been done in the past. History will repeat it's self as long as people don't know history. All wars are started by a few people who will benefit from them and those who wish to take away rights. The Hegelian Dialectic is a method used by all to justify the means. First they create a crisis, like the crisis taking place at our southern border right now, then they wait for the public to demand they fix it and then they fix the problem they started the way they want. If immigration reform comes as a result of this unlawful act, the voting dynamics of this country will be changed forever. There will never be another party to provide our checks and balances, just a socialist agenda which will be the downfall of this country. Every thing for free, take from those who have it and give it to those who want it just for the votes. Those in power did this in both World Wars, backing all sides to make billions of dollars. Prescott Bush, G.W. 's grandfather, supplied Hitler as well as Europe with the funds to fight. The Bush's are very wealthy today because of this. The 9-11 tragedy and crisis, we lost a lot of our rights due to the Patriot Act. Create a crisis ,get the people to rally and take away their rights as a result of it. Stop and think of how many rights we have lost in the last 5 years from government controls ie private land rights to the EPA, privacy to the NSA, health care, taxes etc. The press is controlled by these same people and are making money off the lives of others by censoring the truth so the sheep follow the program. We all want our children to do their homework but we neglect to do our own and wonder why our children are so out of touch with real life. History is being rewritten now and soon you won't be able to find it any more. Big business backs both political parties as the Democrats and Republicans are one in the same. It doesn't matter who wins, the outcome is the same. This is why both sides are against a third party, as the game would fall like a house of cards. Do you notice how both sides trash the Tea Party? You don't see them trash any other group because they are not a threat. The dangerous times we live in now with the entire world on fire is the perfect time for another false flag, again,, crisis - demand solution - fix the problem. Please take the time to do the research and don't rely on TV or talking points from either party. Hearsay is not allowed in any court room, why would we allow it to determine the way we live. Today's kids are the way they are because of us and what was allowed to happen to our schools and colleges thru programs such as the newly imposed "Common Core" and other past socialist programs. Educate yourselves first then you can educate your children before they as well as our true history are lost forever. A lot of our country's history derives from the world wide organization the Free Masons and if you look at their level 33 motto you will see the words, "ORDO AB CHAO" - ORDER OUT OF CHAOS. I would hate to have it written in history that we were the ones that allowed the downfall of America and disgrace all those who fought and died for our freedom. survival rested in the hands of 9 justices who would decide whether the founders meant the individual had a right to possess weapons to protect themselves from those that meant them harm, or tyranny, or whether the words a "well-regulated militia" meant only the states and National Guard were guaranteed this right. In a 5 - 4 ruling, the Supreme Court ruled it is we the people who were guaranteed this right. We kept this right because of ONE vote! ONE! done. No matter how much I disagreed with McCain, his choice for Supreme Court nominees would be infinitely better than that of a man who wanted to "fundamentally change" our Constitution. So I stood in line for over two hours to vote for him and spent a lot of time begging others to do the same. Now here we are in 2012, facing another major ruling by the Supreme Court. Here we are facing another huge and vital election for our United States. Thankfully the 5 Justices who saved the 2nd Amendment are still with us and deliberating over just how powerful the federal government is and just how much control they are allowed over us by reviewing key parts of Obama's Patient Protection and Affordability Act. Obama has already placed two very left leaning Justices in the Court, thankfully replacing only liberal Justices so far. But we would not stand a chance if God forbid he had replaced Justices Scalia, Thomas, Roberts, Alito or Kennedy. 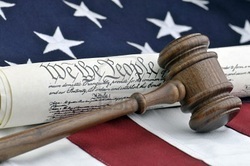 As of now the country sits and awaits the High Court's decision but if one more liberal is placed in our Supreme Court, there would be no doubt that the federal government would be given the power to oversee and rule over every aspect of our existence. So when the Republican primary is finally finished and the nominee left standing takes aim at Obama, I will stand for whomever that nominee turns out to be. For those who are upset with the choices we were given, and I don't honestly blame you, I beg of you to remember one of the most powerful tasks the POTUS is given, that of shaping the highest court in our country along with many other federal courts. Regardless of what I wished to see in the person who runs against Obama in our next election, I will go out and campaign for and vote for whomever his opposition is without hesitation knowing the future of the Supreme Court and our Constitution's survival is at stake. If Romney is our man than so be it, at least we stand a chance of him nominating a reasonable Justice. Just imagine another Justice Kagan being sworn in to make liberal Justice number 5. Hopefully that is enough to inspire the Americans who believe their freedom to be precious and of utmost importance to get out and do whatever it takes to ensure Obama does not have a second term. Let's make sure he does not have 4 more years to fundamentally transform a damn thing. 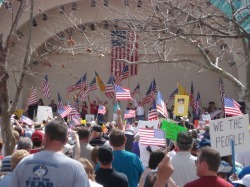 Here is a fact for the media and the politicians, the Tea Party is alive and well. From the very beginning what the Tea Party was and what caused us to join together and scream "Enough" either escaped the grasp of the so called elite of this country, or scared them enough to do all they could to denigrate us and make us seem extreme. The narrative being pushed now is the Tea Party is dead, weak and losing it's power. What is being overlooked is what the Tea Party is. It was not born of established, politically active groups as so many like to claim. It is not the idea of a group of self proclaimed leaders that guide the Tea Party narrative on Fox News. It was born of and lives through the passion of every day Americans who saw the threats to our freedom and the dismantling of our Constitution. It is the hearts and pride of patriotic citizens who want to preserve what so many fought and died for during the formation of our great nation. The Tea Party is only a name given to what became an uprising of freedom loving, hard working people who were awakened by an election that placed extremists who do not respect individual liberty in power. It is the result of us all saying, finally, "Enough"! So there is no way the Tea Party can be dying as it lives inside each of us. We are alive, well and still paying attention. The Tea Party carries on. It is hard to believe that another year has gone by us, and sometimes I find I am discouraged that I wake each day to another variation of the corruption and horrors that I did when we started out on this journey so long ago. I ask myself, what did all of our efforts really accomplish? What real change did it all bring? Invariably, each time, I come to the same conclusion. If we, the faithful and ceaseless patriots of our great nation, were not there, relentless in our supervision of our government gone astray, we would be waking up to far darker times. When you really think about it, we have done a lot. We have stalled the left wings progress and made them fight for every battle. We have a Tea Party Caucus now, have taken control of the House, and it will be a long time before there is an election that we don't sway, IF we stand together and persevere. Years ago, it was universally understood that we have a responsibility to not only our generation, but many generations that come after us. We are all that stands between their demise and their prosperity, their very freedom and their slavery to a government that our country was built to bring freedom from. It is we who stand with and for the soldiers who risked and lost their lives for this freedom and the most beloved, influential, and important piece of writing in history since the biblical texts, our Constitution. I say to myself, and to all Americans, this is no time to grow tired or weary. This is not the time to sit and wait. When the armies that form against us seem too formidable, we need to remember our strengths. Our numbers make us something that the powerful find fearful, or they would not be striving so hard to put us down. We have taken the higher ground, even when the Left has called us abhorrible names like racists and terrorists. We have stood, and will continue to stand, above the rhetoric, because we understand that this is just another of the leftist tactics to incite violence and condemning behavior from us. Their efforts are ramping up. They hope that the emotional tinder box that they have created in this country will lead us to disgrace and violence, to become the very things that they themselves are. But we are above them. Our peaceful revolution can not be altered or stopped. It is our endurance that holds the hand of destiny. What our children's children read about us in history books, or whether they read about us at all, is up to us. The life and the country we leave to them will be looked after by none other than us. We must hold the line fellow Patriots, it is only the beginning. In the battle we have been forced into, neither compromise nor defeat is acceptable. God bless and save our beloved USA, and the faithful citizen patriots who fight each day to preserve her for many generations to come. Thank you, to everyone who volunteered, who sent donations and words of encouragement and who took the time out of their busy lives to come out and speak out on August 22nd! Approximately, 3500 patriotic Americans joined us at Lake Eola for a peaceful and inspirational celebration of our country and to speak out against the reckless expansion of an already over-reaching government. We received so many comments about our fantastic speakers who both informed and motivated the crowd and we are very grateful to our wonderful experts for sharing their time and their expertise. We would also like to thank all the state-wide organizers who rallied their troops to support us here in Orlando. We hope to have the opportunity to return the favor. To learn about all of the speakers and groups that participated in the rally, click HERE for our official program. Now it is time to dig in and finish the work we have spent so much energy on this past summer. In July, we managed to stall H.R. 3200, but pro-reform groups like Organizing for America and Moveon.org are determined to push this bill through this fall. It is up to US to make sure that they cannot. This means that we have to make more phone calls, write more letters, make more office visits and rally more often and in larger numbers. We are asking you to take a few minutes out of each week to simply call our legislators and let them know that we expect them to vote NO on H.R. 3200, NO on public option and NO on mandates. To learn the best ways of contacting your legislators, click HERE for our information sheet. If you would like to be updated about upcoming Townhalls and protests, we invite you to sign up for our new Activism List here and we will send out bulletins as events arise. 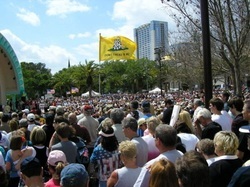 Uniting For America Rally Lake Eola, Orlando, FL August 22nd 2009 6 - 8 pm. Despite the citizens of the United States being more active and outraged then ever before, the politicians currently in charge of our country are pushing harder and faster to fundamentally change the greatest nation to ever have existed. The very thing our brave forefathers and veterans fought for and our heroic troops are still fighting for, our freedom, is again being attacked today. Never could we imagine how swiftly the Congress and the White House would act to bombard us with legislation that would enlarge the federal government's power over every, single aspect of our lives! All of us are making a difference whether by participating in tea parties, protests or contacting our elected "representatives" to demand this power grab and irresponsible spending needs to stop! We are inviting all of Florida to continue the fight in Orlando on August 22, 2009 by Uniting for America at the amphitheater at beautiful Lake Eola. This event will focus on effective actions we all can take to protect our nation from liberty despising politicians and destructive legislation such as Cap and Trade and Government controlled health care. Strong focus will be placed on the Florida Sovereignty resolutions that have been entered into our House and Senate and we will have declarations of support to sign to help push this legislation through in 2010! A bit of history will be shared with us by a Florida Frontiersman whose passion is the Declaration of Independence! Also you can expect a moving tribute to our veterans and troops. 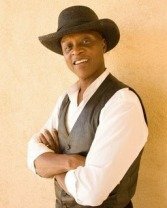 The one and only Lloyd Marcus will be emceeing and performing and the talented McPhersons who brought out so much emotion in us all on March 21st will do so again on August 22nd! So mark your calenders and spread the word! The silent majority is mad as hell and we will be heard all the way to Washington D.C. Please click here for more information!! Please click here to read about the ties between one of the largest companies in the world and the President of the United States. We believe you will be as appalled as we are at just how much the CEO of General Electric and Obama help each other out.